Published in the South Kent Gazette, 1 April, 1981. The general name of Buckland Bottom served for the district until 1865, when the Corporation named the new road to the workhouse, Unicoi Road and the lane that led up to Coombe Farm, St Radigund’s Road. Since then other names—Victoria Street, Edgar Road, Prospect Place and Randolph Road have appeared on the south side; Magdala Road, Primrose Road, Macdonald Road and Lambton Road on the north; as well as a marginal line of houses on the south side of St Radigund’s Road. In the estimation of the Corporation, St Radigund’s Road, 120 years ago, was of sufficient importance to warrant their purchasing from Mr Eastes and Mr Matson, pieces of land for widening the lower part of it. In 1868, Mr Edward W. Fry laid out Magdala Road, which, in addition to being a pleasant residential thoroughfare, formed a line of cross-communication from Union Road to St Radigund’s Road and newer streets in Buckland. Victoria Street is much more modem, occupying the western margin of the old farmyard. Edgar Road, of earlier date, faces the railway near the entrance' to the railway tunnel, 660ft. in length, Which passes under Chapel Mount to Tower Hamlets. On a higher level were built Edgar Crescent and Prospect Place, the latter forming a row of well placed cottages, backed by a large area of allotment grounds, Further west, standing in pleasant grounds was built Victoria House, the residence of Mr Raphael Herring, the manager of the gasworks. Randolph Road was another street, of forty good houses, running up the hillside, built by Mr Keeler. Turning to the north-side, Primrose Road, just beyond the gasworks, dates in part from the late 1860s and probably the Old Primrose Hall was one of the first of the fifty or so houses built there. The houses on the side of Union Road gradually increased, until they have extended beyond the old workhouse, on the north side; but on the south side, in the upper part, the land for a long time was reserved as garden grounds for the workhouse. The oldest block of houses in St Radigund’s Road was named Pilgrim’s Place, in reference to the pilgrims who, in ancient times, toiled up this slope to visit St Radigund’s Abbey. Although appearing to be old, it is probable that they were of the early part of the last century, and that 170 years ago there were no houses between London Road and Coombe Farm. At the upper end of Union Road the land on the north side was laid out by the old Dover Corporation as allotments; and on the south side was a brickfield, at the back of which ran Whinless Down. In recent times the name of this ridge has been changed by some people to Windless Down, which is strikingly inappropriate, as anyone will discover who goes up there when there is any wind about; but Whinless Down, -which is the old name, preserved in the Ordnance plans, is derived from the fact that whins, or gorse, which grows in profusion on the other ridges, was long absent cm this hillside. According to the Ordnance plans, there are four ancient tumuli along this ridge, but there does not appear to be any record of their ever having been explored. At the junction of Buckland Bottom with Poulton Valley was Coombe Farm, farming part of the Barton Manor which belonged to the Dover Priory, anciently known as Dudmanscombe, and vulgarly called Deadman’s Coomb. Part of this farm was later used as municipal allotment grounds. Beyond, on the hill, are the ancient ruins of St Radigund’s Abbey; while below is the silent valley of Poulton, which comprises a parish in itself. There is one farmhouse, but this little parish of Poulton, unlike more populous places, has neither church, parson, public house nor pauper. The total number of houses in Buckland Bottom in 1906 was about 400, with a population, apart from the workhouse, of about 2,000. 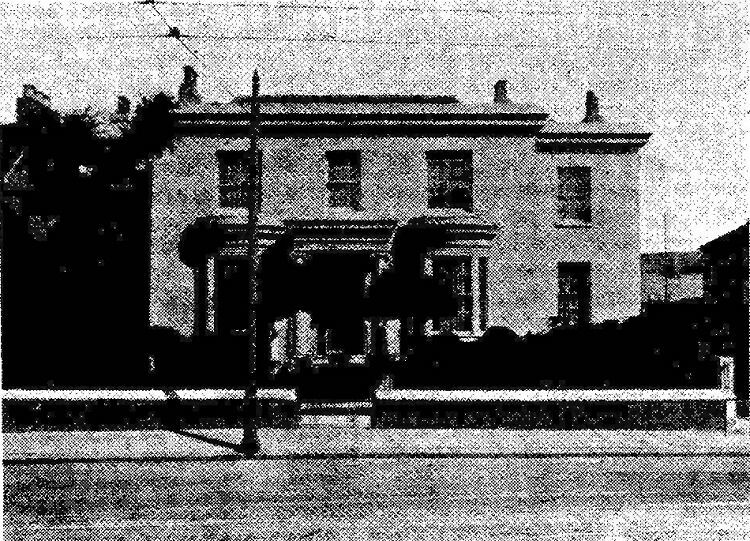 A survey of the southern approaches to Buckland would not be complete without further reference to a substantial house which stood on the comer of London Road and Alexandra Place until well into the 1950s, albeit in a ruinous condition. This was Bucklands, the home of a distinguished Town Clerk, Mr George Ledger, already referred to, and, later, the Reverend Henry Fielding and his five daughters. Miss O. M. Rookwood, in her book, Buckland-in-Dover, published in 1952, relates the strange story of how, under the somewhat eccentric Mr Fielding’s will, the Fielding girls were prohibited from marriage and devoted themselves to social work in the parish. The girls attended Buckland Church but the family never sot together. Each girl sat by herself. The good work for the community of the eldest daughter of Mr Fielding is commemorated by a Dorcas window in St Andrew’s Church, which is appropriately reminiscent of the flannel petticoats she made and distributed to each of her many godchildren. It was one of her aims to arrange the baptism of as many children in the parish as she could and she often stepped in to become a godmother to the children. 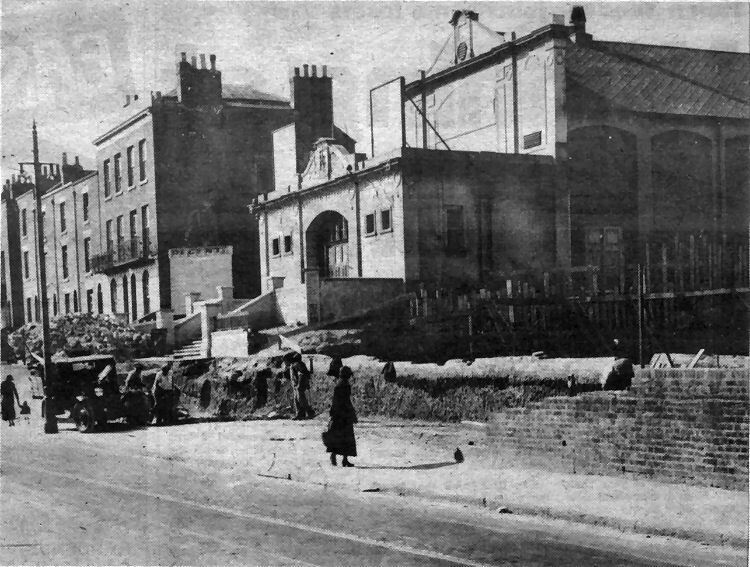 The old Buckland Picture House, later known as the Regent Cinema, in London Road, pictured in 1936 shortly before it was demolished and replaced by a new cinema on the adjoining site. The old cinema was closed on Sunday, 31st May 1936, the final programme including the film The Imperfect Lady, starring Cicely Courtneidge. The new Regent later became the Odeon which was recently demolished to make way for the new TA Centre. The workmen in the picture are cutting away part of Buckland Terrace to create a forecourt in front of the site of the new cinema. Many tons of chalk and earth excavated from the site of the Regent were used to restore the pathway from Priory Hill to Tower Hamlets which had collapsed. Above is a picture of “Bucklands“ which stood opposite the old picture house.